Alba Beech Mushrooms, Hon-shimieji, Alba Clamshell, or Hypizygus tessalatus retains a crunchy texture after sauteing. 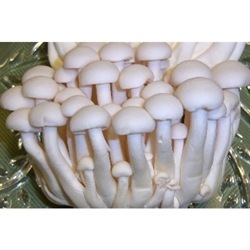 To reduce the mushrooms natural astringency, blanch in salt water for 2 minutes and add to your favorite recipes. Great in many dishes, especially in soups. Creamy white quarter sized caps, 2-3 inch stems, and a mild seafood flavor. Ready to eat, no cleaning necessary. Will last 2-3 weeks in the refrigerator in the bag they come in. Do not open until you are ready to eat them. Each bag is approximately 4 ounces. Weighed in on a certified scale because the weight on the bag is the minimum weight of the mushrooms, not the actual weight.